and a detachable base that is dishwasher safe! It mixes light batters, perfects whipped cream and stiffens egg whites for beautiful meringues. And the lucky gal that I am, I was asked to test one out! 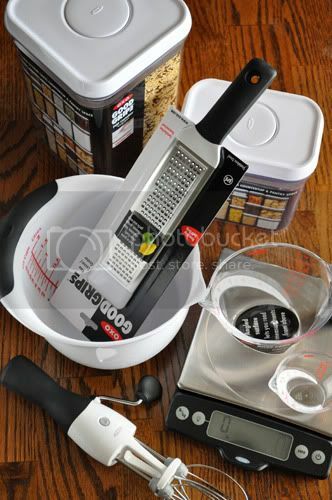 Along with their featured GoodGrips Egg Beater, I also received two POP Containers, a two-cup Angled Measuring Cup, a Food Scale with Pull-Out Display, a Batter Bowl and a Fine Zester/Grater. So many fun new things to work with… I’m in gadget overload! Since Halloween is just around the corner, I decided to test out the egg beater on my great-grandmother’s drop sugar cookie recipe. But since I needed to cut these cookies out, I adapted the directions a bit and rolled the dough out beforehand. 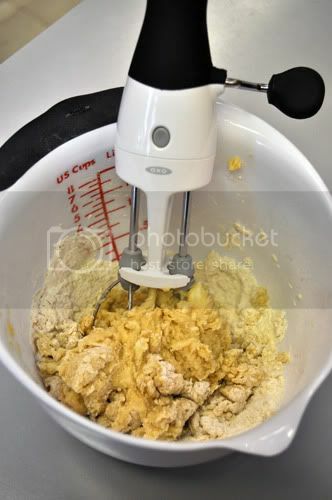 Once the ingredients were in the bowl, the beater was a breeze to use. The dough came together quickly and once it was time to wash dishes, I just pushed two little buttons and the beaters popped right off! I’m quite impressed with the redesign and can’t wait to use it again. Thanks so much to Foodbuzz and Arianna at OXO for the opportunity to test these products out! Cream the fat and sugar. Add eggs and beat until well blended. 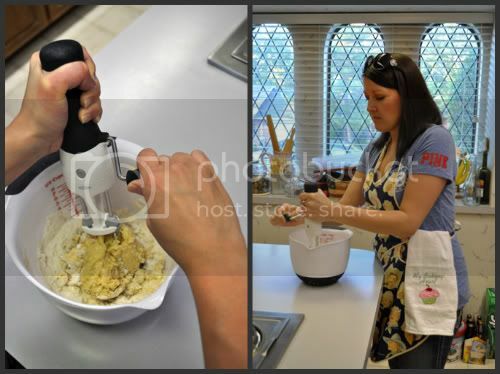 Add flour, baking powder, salt and vanilla to creamed mixture. Stir to mix. Gather the dough and place in between two pieces of plastic wrap. Roll dough out until it is about a 1/2-inch thick. 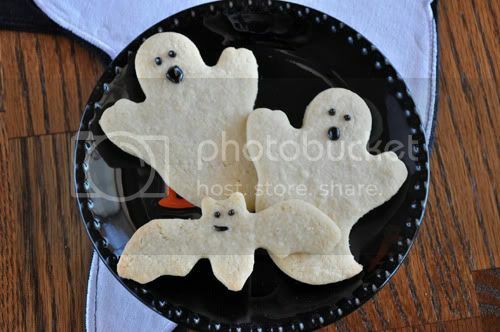 Using cookie cutters of your choice, cut out shapes and place on a greased (or parchment paper-lined) baking sheet. Add a dusting of flour to the dough if it becomes sticky. Bake at 375 degrees F, 10 to 12 minutes. Cool cookies completely on a wire rack, then decorate as desired. Disclaimer: As part of the Foodbuzz Tastemaker Program, I received a selection of kitchen products from OXO to use in testing. Such cute little “boo” faces! I’m sure they’re very tasty!! Love the little bat “smirk”! 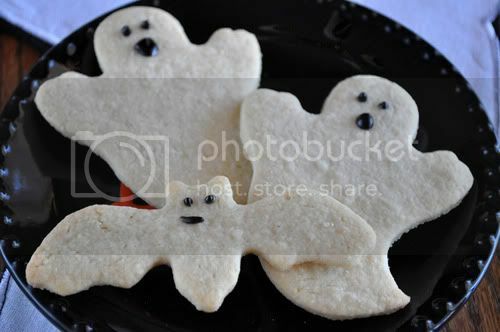 I love these cookies, I’ll have to remember them for my Halloween round up next year. And I can’t think of certain recipes without thinking of my Grandma using her little hand beater..it was a clunky old thing. I’ll have to try the OXO ones!